Dr Thibault Bécavin got his DDS in 2010 at the Faculty of Dentsitry of Lille, France. The same year, he became Assistant Professor in the department of Conservative Dentistry and Endodontics. He worked in several dental office before focusing on a hospital and university career. He received his master degree in health and biology in 2012 for his work on age estimation after pulp/dental hard tissues ratios determination in molars by micro-CT scan. 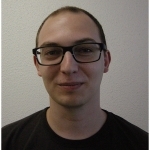 He started his PhD in 2012 in the INSERM UMR 1109 (Osteoarticular and Dental Regenerative Nanomedicine) laboratory headed by Dr Nadia Jessel. - Bone/tooth unit development by using functionalized nanofibrilar membranes.